Sally and I took a trip to East Africa recently. In 8 days, we took 3,000 pictures and videos. We saw a part of the world different from our own and got a glimpse of their lives.Kenya is a poor country with agriculture and tourism as its main source of income. Its capital, Nairobi, is a major city in East Africa. Kenya loves to present this downtown skyline as a demonstration of its modernity and prosperity. But most of the tall building are government ministry offices and monuments. 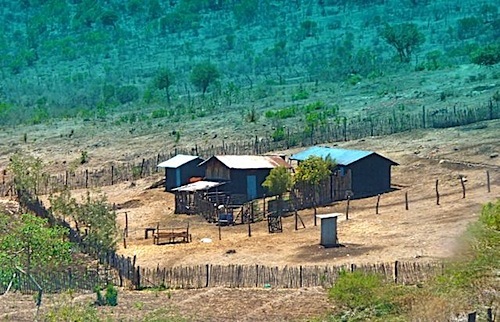 Most Kenyan in the countryside live in small tin-roofed sheds like these. 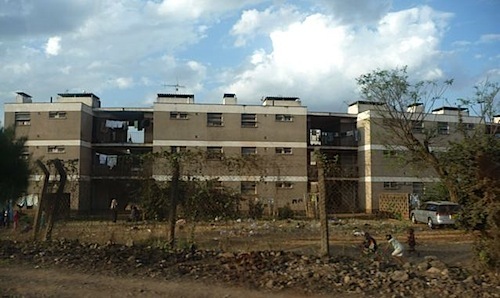 In the city, the Kenyan government build some public housing similar to these blocks and rent them at very low subsidized rent. A family lucky enough to live in a 12 ft X 12 ft room pays US$2 /month. A few lucky folks in the rural areas may live in a farm such as this one. Note the outhouse is far away from the main complex. Unlike China where public toilets often stink, Kenyan public toilets generally are odorless and acceptably clean. 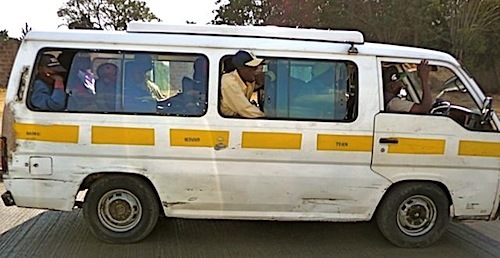 Kenyans take mini buses converted from vans. Such crowded vans carry 14 passengers and seem to be everywhere. Poverty creates another form of public transportation. Bicycle taxis carry one passenger only. 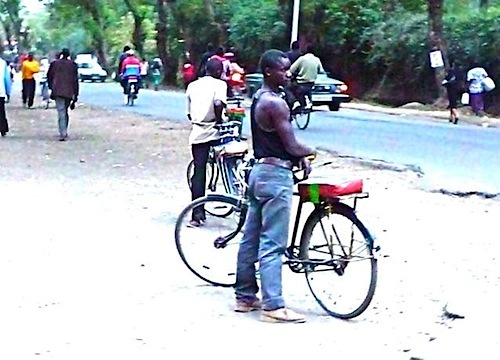 Most poorer Kenyans walk half an hour or more to go to work. 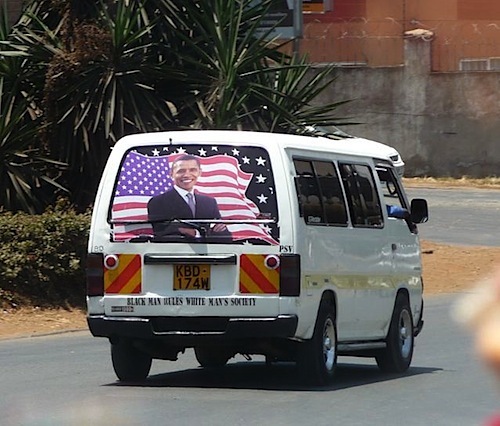 As President Obama is part Kenyan, Kenyans are proud of his achievement. But this van seems to have misread the meaning, sporting the words “Black man rules white man’s society”. 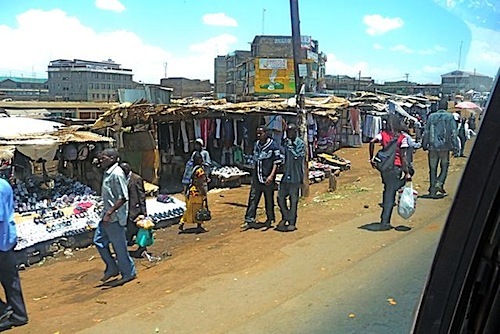 Outside Nairobi, some 40% of its citizens live in squalid slums. On the edge of this slum, stalls spring up as market place for its residents. Our tour group did not enter the slums. I believe we would have been shocked by the living conditions if we did. 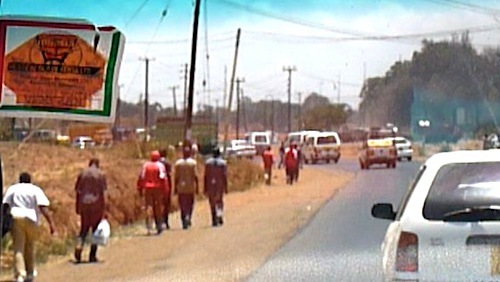 A rural roadside row of shops display colorful facades, reflecting Kenyans’ love for bright colors. 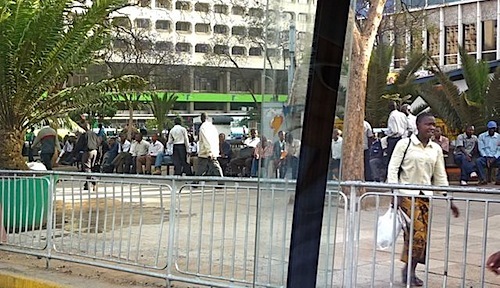 As employment opportunities are few in Kenya, job seekers sit on benches in downtown Nairobi and wait for potential employers to interview. 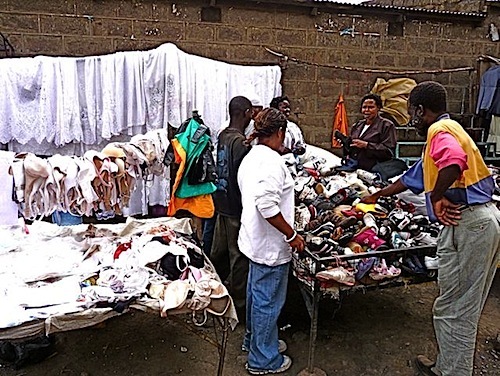 Most Kenyans find entrepreneurship the only way to make a living. These poorer folks earn US$100 per month. 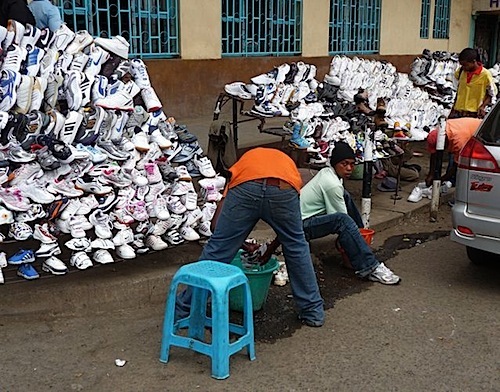 In a town’s commercial street, used sneakers are washed and sold. Used clothing are sold extensively. Even used (hopefully washed and cleaned) underwear are available. 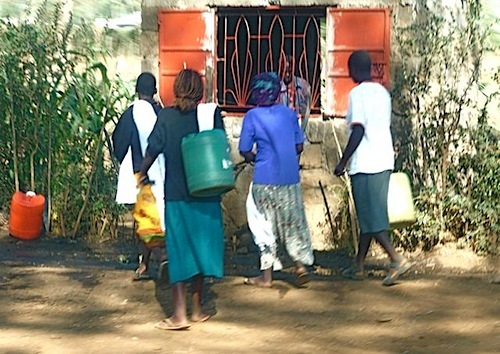 Kenyan living in rural areas have desperate need for drinking water, especially during the current drought. 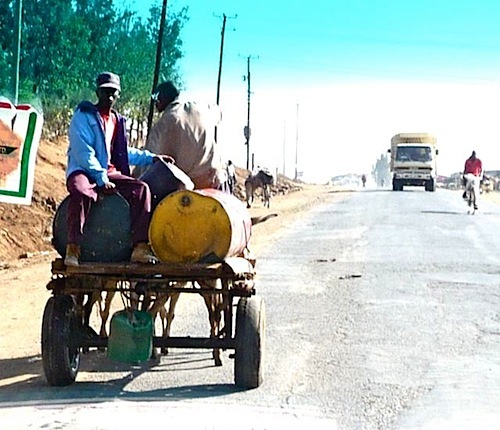 A three-donkey cart carries water for sale. Women carry buckets to fetch water from local wells. Many people make a living supplying water to the population far from water sources. A 5-gallon jug is sold for US$1.50. 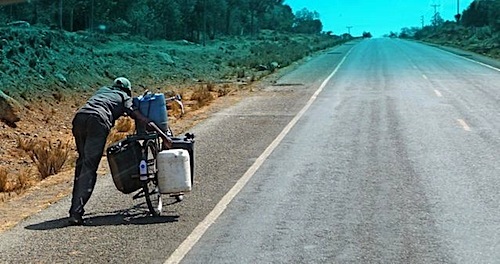 This man pushing his bicycle loaded with water up a long stretch of hill works very hard for his earnings. Having seen this, I deem myself lucky every time I turn on the faucet and enjoy clean water gushing out for my use. Posted by Robert Wu on Tuesday, September 29, 2009, at 9:24 pm. Filed under Uncategorized. Follow any responses to this post with its comments RSS feed. You can post a comment or trackback from your blog.